November was definitely the month of the bears – the Chicago Bears. Not only are they burning up the NFC North, they’re dedicating their time to support The Salvation Army. The month started off with the kick-off to the Chicago Bears/Jewel-Osco Coat Drive. This is the 30th year the team has collected coats for those in need. In total, they’ve collected enough coats to give one to each person in attendance at a Bears game 10 times over! Bears players Akiem Hicks and Cody Whitehair were also on hand during the press conference to talk about their support of the Army. New or gently used coats can be dropped off at all Jewel-Osco locations through February 1st. Safety Deon Bush and defensive lineman Sam Acho joined staff in The Salvation Army’s homeless outreach unit, handing out meals and taking pictures. Bush volunteers regularly throughout the Chicagoland area, supporting organizations who serve those most in need. Acho is also socially active and was excited to support Bush in this endeavor. After handing out hot soup and kind words, Bush and Acho returned to The Salvation Army Freedom Center to visit with kids in the after-school program. Bush even joined in a game of basketball! In addition to supporting the Bears coat drive, Whitehair made a stop at The Salvation Army’s Emergency Disaster Service warehouse to pack Christmas dinner boxes with Taft High School’s freshman football team. The group packed almost 500 boxes in just a few short hours! 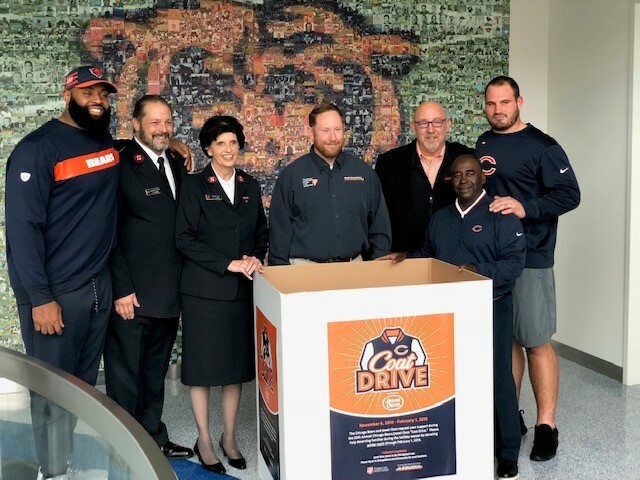 We’re grateful to the Chicago Bears for joining the Fight for Good with their extraordinary support of The Salvation Army’s services to those most in need throughout Chicagoland. Join The Salvation Army's Fight for Good during the Christmas season! Learn more how you can help brighten the holidays for a neighbor in need! Be an Angel Tree Donor!